how the tragic loss of his youngest son led to a spiritual awakening. 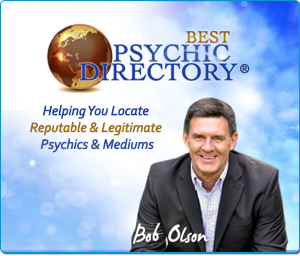 Despite being the son of renowned “Psychic to the Stars,”Dr. 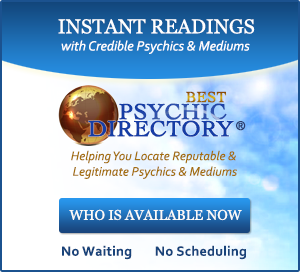 Richard Ireland, Mark Ireland’s life took a more conventional path until the unexpected death of his son Brandon plunged him into the world of mediums and psychics. Soul Shift: Finding Where the Dead Go by Mark Ireland is an intimate, personal account of a father’s unbearable loss, and his journey towards a better understanding of death and an acceptance of his son’s fate.While Ireland loved his father, he chose to pursue a career as an advertising executive–shelving spiritualism in favor of a pragmatic approach to life. On the day of his son’s death, Ireland was disturbed by an ominous premonition regarding his son. 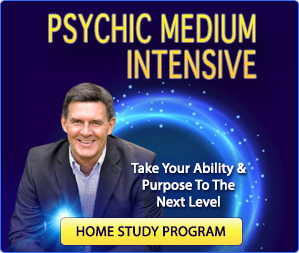 With his worst fears later confirmed, Mark reentered his father’s world, intent on connecting with the realms of spirit, and consulted a number of well-known psychics including Allison Dubois, the subject of NBC’s hit show Medium. Proceeding with modest expectations, he was struck by the remarkably accurate information provided in these readings. Soul Shift is an amazing story of psychic communication, which will bring comfort to the bereaved and cause even the most skeptical unbelievers to broaden their views. 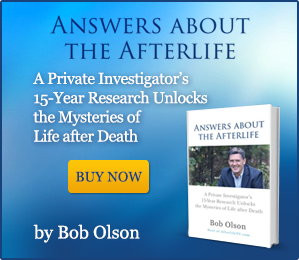 The author’s bold exploration of paranormal phenomena and evidence of life after death, and his moving attempts to contact the dead, will touch many readers, and change their perspectives on death forever. You can purchase a copy of Soul Shift: Where The Dead Go by clicking here: Click For Book On Amazon. Loss as a catalyst for spiritual awakening…….absolutely……It sets the path for the rest of your life, my son left his body through my hands…..resulted in a life long quest…..no longer did I wonder if…..I was given the gift of knowing. To lose your son in your hands and come through it with this knowing. That’s powerful. Thank you. Hi: Just saw the video of Mark Ireland and how he was awakened spiritually after his Son’s death. I have a comment on that, if I may. Since my Son recently passed unexpectedly on Dec. 15th, 2011 right before Christmas from a Pulmonary Embolism caused by DVT he was 40, was a non smoker, didn’t drink or use drugs or smoke & was a marathon walker for good health.However, I noticed that when we were on vacation in August I said, “You know, Robert, if anything would happen to you I would never come here again for it would be too painful” Also, in November I said, “Why are you saving those new Nike sneaks? Life is short, so don’t save anything.” The most shocking thing was that I asked him if he would want to donate his organs when he died. Then we were both recalling how my Dad, a week before his passing told me in case of his death he would contact me by turning the TV on & off, which he did. My Son told me that he would put a message on the TV. About 2 weeks after my Son’s passing I had the TV on but was deep in thought & not looking at it. When I heard, “Mom, don’t worry about me, ok. and Mom, I want you to know that I appreciate you and love you and Mom, you’re doing alright. What do you think of all this? Also, right before his death, 5 days before, he told me that “It will be all over for me soon, Mom” I was horrified but didn’t want to know any more. These stories you have shared are both interesting and not as uncommon as most people think, although many people would not have the awareness to recognize them as you have even in hindsight. I do believe that we are being prepared for the losses in our life, as well as our own departing of this physical life, by our spirit guides through our intuition and other means. But it’s impossible to know when a conversation about “organ donation” or “life being short” is a premonition into the future. Plus any premonition is only a potential at that moment that can be altered by our own free will. In other words, these little hints or preparations from the Universe are not so we can try to prevent death, but rather, so we are prepared for it. I think what you’ve shared here is wonderful validation that your son’s passing was meant to be, which is a gift that not everyone gets. And the after-death communications you mentioned at the end are incredible gifts too, which I believe we all get but are not all able to recognize (often due to our deep grief). Thank you for sharing your stories so that those who read this might gain a new awareness of these messages and lessons in their own life and for their own benefit. I Really enjoyed your interview with Mark. My sincere sympathy for the loss of his son. I love the insight he brings of his journey of discovery of the afterlife after his son’s death. Thank you for posting the videos of his father Richard. He was truly amazing and really seemed to enjoy working with people. 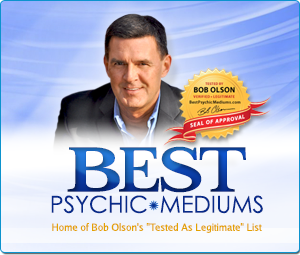 Bob, I look forward to more interviews and find your website full of valuable information. I appreciate your remarks. Mark really does bring helpful insight in the video and in his book. And I too love the videos of his father. This was a wonderful interview, Bob. I especially appreciated the fact that here we have a man about as far removed from anything otherworldly as one can get, doing a complete 180 degrees. I really enjoyed listening to the interview and gained a lot from it. I will be getting his books. You are doing great work, Bob. Thank you so much. I have read Mark’s book a couple of years ago as I too am constantly searching for clues about the afterlife. I can identify with that gut feeling he spoke of. The night my husband was killed on his motorcycle, I didn’t want him to leave me but felt selfish in asking him to stay at a horse show my daughter and I were attending. As he left I had that same, sick sensation in the pit of my stomach which now I believe was a type of premonition. Since his death there have been many, many signs and things happening that I know could only be from him. Thanks to all whom Bob has interviewed and thank you Bob for all you do! BTW, my stepdaughters and I will be at an event with James Van Praagh in early April in Connecticut. Living in VT and upper NY state we’ve been patiently waiting for him to be close enough for us to make the trip!! It’s so true. It was a wonderful message that came out in this interview. How nice that your husband has been sending you signs. Have fun at James Van Praagh’s event. I’ve attended two and he was wonderful each time. 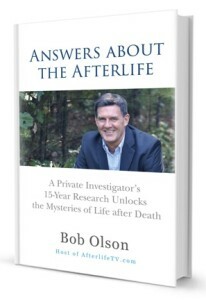 Be sure to watch my four video interviews with him on AfterlifeTV.com. I really enjoyed the conversation between Mark Ireland and Bob Olson. I can understand that his son’s death is an unbearable loss of mark Ireland. Now, I am going to watch the other videos of Mark on Afterlife. Death absolutely is a catalyst for spiritual awkening, people are looking for answers and start to think in a way that they haven’t done previously, perhaps because they never felt the need to. With experience, spirituality can be extremely comforting and help with the healing process when dealing with death. Thank you for this. I lost my only son, suddenly and unexpectedly, in 2011. He was 20 at the time. My spiritual journey began then and my life changed. In some ways, for the better. Thank you for this. It means so much. You’re most welcome. I’m sorry for your loss. And I understand how loss often leads people on a spiritual journey that changes them for the better. I’m glad this Afterlife TV episode resonated with you.